Learning NEXT: Writing should not be "tedious"
The first sentence of an article promoting "awesome" iPad apps reads thusly: "Writing is a tedious task and as such kids find it hard to sit down and write." Ugh. Balderdash. Ugh again. If writing is a "tedious task" it's because that's the way the teacher is teaching it and presenting it. No app is going to make writing less onerous if the teacher truly believes that writing is a "tedious task." And the only things these apps do is present the same sort of possible writing activities teachers might do in class but do so on a web-based application or via an app. So let's back up for just a teeny second or several and talking about writing and why some consider it a difficult task. Most teachers I know blanch at the grading. They don't know how to grade it and/or there is a lot to grade if they have several students in their classes. One more step back then: why do we ask students to write? I don't mean that in the broader and more esoteric sense, but in the very real "what are kids learning by doing this?" sense. Kids start to think writing is about grammar and mechanics only, and they begin to lose the sense of wonder about writing, which leads to discovery in its own right. Teachers obsess about spelling and punctuation, which is important but can muddy up the significance of ideas. Do you know why there are editors in this world? In my opinion, because even the best writer needs some help with structure, grammar, and mechanics. Because the best writers on focused on the ideas of the text. Yes, they recognize the importance of word choice, punctuation, spelling, and all of that, but they also recognize the superlative importance of getting the ideas on paper first. So why do we ask kids to learn how to write? The same reason anyone writes: to convey information, to explain, to excite the imagination, to communicate emotions and passions. For the youngest of our writers, the hardest part is learning how to write, literally. Gripping a pencil and forming letters, and then forming words. Or using fingerpaints to draw letters. Or crafting letters with Play-Doh. 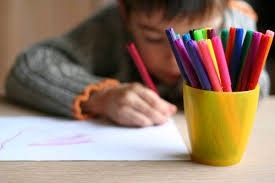 Or use Wikki Stix or some other something to let kids play with practicing their letters and learning words. And don't fret over the backwards "N" or "E" or funky "S." That will come in time. Reading to kids and then having them make up their own versions of the story or what happens after the end of the story, so they can use the text of the book to help identify and find words to use. Let them make up words. Shakespeare did and he was a pretty good writer. As for older kids, well, it depends on their age and it depends on what they're learning and it depends on what the teacher needs them to learn and reinforce. I don't think writing should be separate from anything else. I think writing should always be a part of other learning. I worked with a school some time ago who had some great activities for their kindergartners that were reinforced in every class by every teacher. Every day those kids wrote about something. The alphabet was on the wall in the K-3 classrooms and every teacher in the school had a word wall. In kindergarten, they used that lovely newsprint lined paper but kids could use pencils, colored pencils, or crayons, or some combination. So kids wrote and could, of course, draw on their papers, too. There wasn't a specific number of words they had to write or a particular number of lines they had to write. They just had to write. The point was that they were to write. Every day. And the kindergarten teachers worked with their students to create a portfolio for every student. At first the kids put only their writing in those portfolios, but then the kids wanted to put everything in their learning portfolios. In the first two weeks, teachers offered prompts for the kids. They would have the prompts on the board and students could choose to write about the same one or different ones throughout the week. The prompts were on the board so students would see them all day and would, therefore, be thinking about them off and on all day. The prompts were pretty general and teachers weren't surprised when at first kids would write about recess, about something at home, about a friend--and illustrate it accordingly, of course. And then kids started writing about what they were learning. And as the kids started writing about more complex ideas, they would raise their hands for help with a word or do their best to figure out how to spell it because the teachers told them not to worry about spelling or punctuation but to focus on their ideas. That's why we teach kids to edit and revise their work. Eventually. And then one student wrote about how he was always forgetting to put a period at the end of a sentence and he wanted to practice that. And another student wrote about wanting to be a better reader to learn more words. What works in kindergarten can work in other grades. The topics and the prompts might be a little more complex as does the process. As students learn the process of writing and become more comfortable with editing and revision, they learn why grammar and mechanics matters and how some of those details can improve their writing. In my opinion, writing becomes a tedious task because we make it so. We require students to write a specific number of words or pages so they are more concerned about the right number of words or the right number of pages or, heaven forbid, writing only five paragraphs, that they are distracted from their writing. I will admit that teaching writing is exhausting. It requires a lot of time and it requires a lot of patience. Sitting down with a student to help them see why they have too many ideas in a single paragraph and why they need more than one paragraph is something (among many other things) teachers would love to be able to teach in one fell swoop. But the thing about writing is that it requires some coaching because writing is a very individual activity. Sure, we can have kids write collaboratively and there is a lot of power in that activity. It also saves on grading. There are ways to reduce some of the stress of grading through peer work, but that takes some time, too, to teach kids how to do peer reviews well and effectively. I don't think there is one single way to teach writing well. I think much depends on the comfort level of the teacher and then a lot depends on the personality of the class of students. Some kids may do well with having a word scavenger hunt throughout the week and others might prefer a different kind of word jumble activity, but, again, so much depends on the learning objectives and how these writing activities might be tied to other learning. Want some coaching on teaching writing? Contact me. Today. Right now.